When built, the Harper College Astronomical Observatory was home to a 12 inch Newtonian telescope that was built in 1885 by the Rev. John Peate. The telescope was donated to Harper College by the DuPont Family through the efforts of Paul Sipiera, Planetary Studies Foundation president. Free public observing sessions are held regularly at the Observatory throughout the year. Man has sought to understand the skies since he had the capacity to wonder about them. One man, challenged by the need to pursue that age old desire, built his own telescope over 100 years ago. In 1885, when he was about 65, the Rev. Dr. John Peate built a 12-inch reflecting telescope. He used it in his Greenville, Pennsylvania observatory until 1902. On January 27, 1902 the _Salina_Daily_Union_ reported that Kansas Wesleyan University of Salina, Kansas, agreed to purchase a 12-inch telescope built by the Rev. John Peate for the sum of $500.00. Peate refused to ship the instrument to Kansas until a suitable building was provided (for an estimated cost of another $500.00). Funding for the telescope and observatory came from Wesleyan students, faculty, and friends in Salina, Kansas. When the telescope was delivered to Kansas Wesleyan University on May 19, 1902, the "Hoyt Observatory" was ready and waiting. 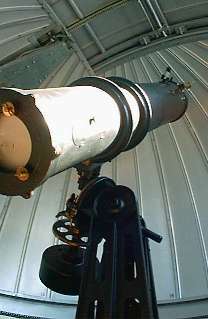 As soon as it was mounted, students and faculty began to use the Peate telescope. During 1909, the Peate Telescope was moved to the new 3-story Carnegie Building on the Wesleyan Campus - its height provided an improved view of the skies. In 1969 Wesleyan University completed a new science building which included an observatory dome on its roof. The Carnegie Building was showing signs of age and interest in the Peate Telescope was declining. Joseph DuPont removed the telescope from the Carnegie Building upon his graduation in 1971, disassembled it, and brought it to his parent's home in Watchung, New Jersey. It remained there unused in a barn on their property for many years. Paul Sipiera, an instructor of geology and astronomy at William Rainey Harper College in Palatine, Illinois, met James DuPont, father of Joseph, through their mutual interest in meteorites. James mentioned the telescope and the possibility of Paul's being able to use it at Harper College. 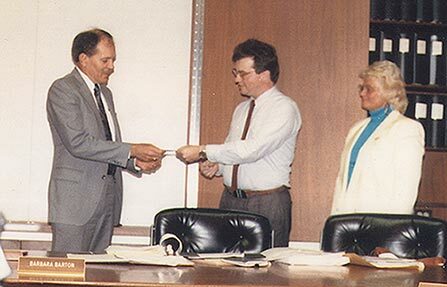 In 1988, Joseph DuPont donated the telescope to Harper College in honor of his father James. By August 1988 the telescope was stored in the Astronomy Department at Harper College. Considerable private fund raising efforts led to the construction of an observatory on the Harper College campus. The Harper Astronomy Club, the Student Senate, the Harper College Educational Foundation, interested individuals and community groups all helped. In addition, the local chapters of the National Space Society undertook their own fund raising effort o	n behalf of the project. This effort was assisted by the National Space Society's national headquarters. Locally the effort was spearheaded by the Northern Illinois Space Advocacy, which subsequently merged with the Chicago Society for Space Studies. In the spring of 1989 Mr. Warren Kutok of Evanston, Illinois did some partial restoration work on the telescope. The grand opening of the completed observatory was held on August 24, 1989. National Space Society chapter president Jim Plaxco presenting check to Harper College President. Additional restoration work during the summer of 1993 improved the performance of the telescope threefold. Walter Trentadue, a local astronomer and telescope restoration specialist, resurfaces the primary and secondary mirrors. He also rebuilt the spider mount for the second mirror and made other adjustments. Thousands of people have taken advantage of the numerous free public observing sessions that have been scheduled. For many, it was their first to look at the heavens through a telescope. Many have expressed a sense of wonderment upon seeing the magnified images of our Moon and planets. Harper College will continue to make this historic instrument available to the public for many years to come. In 2000 the observatory was officially named after NASA astronaut and astronomer Karl Henize who passed away in 1993 while climbing Mt. Everest. It was my distinct pleasure and privilege to have had lunch with and been given a tour of the Johnson Space Center by Dr. Henize during a one day visit there following a conference I had been attending. Also, the DuPont telescope has been replaced by a 14" Meade telescope. Get a map for directions to the Harper College Observatory.